In the art presentation world, we use the word “format” to refer to the artwork size, not the overall dimensions of the product to contain that art. 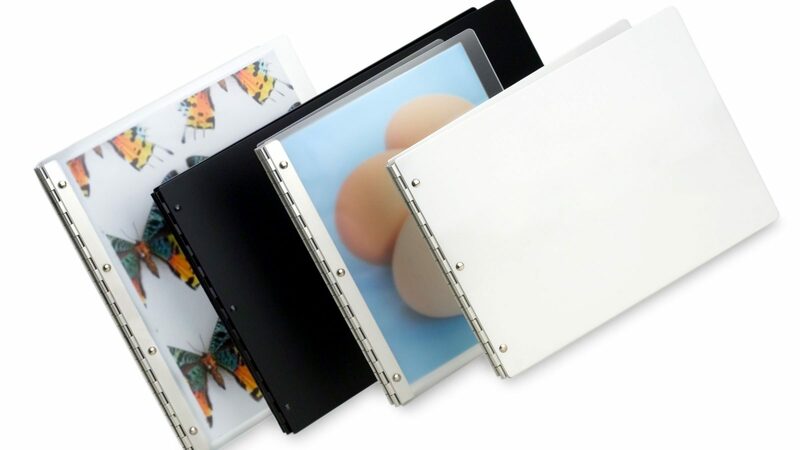 There are eight standard formats for print portfolios in North America, and at least that many abroad. We stock all of them, and make custom-format books every day. One of the first decisions you need to make before creating a print presentation is to choose the format in which you will be printing your work. Though this is not an absolute must, ideally all of your prints will be of the same format. If your work is printed on various sheet formats, you could place them all in a box or book that accommodates the largest sheet, but the look will be disjointed and disorganized. A better approach would be to print everything on the format required for your largest work. In general, large format portfolios are harder to carry, ship and store, but they may present your work more favorably. Therefore, if you plan to carry and present your work in person, going with a larger format, such as 13x19 portrait, may be a good choice. If, however, you will be mailing your book and potential clients will be handling and storing it without you present, a smaller standard, like 8.5x11 portrait might be a better choice. The UPS and FedEx small boxes measure approximately 12.5”x10” making them the perfect size for shipping 8.5x11 portrait books. If you plan to use overnight delivery in your marketing, you would be wise to plan your presentation format with this dimension in mind. Your choice of format may also be dictated by your industry. Models for example, are urged, if not required, to use 9x12 portrait books. Most architecture portfolios are in 11x17 or 11x14 landscape. If your industry has standards, you would be wise to not buck those standards and to look at variables other than format to make any statements about your individuality.